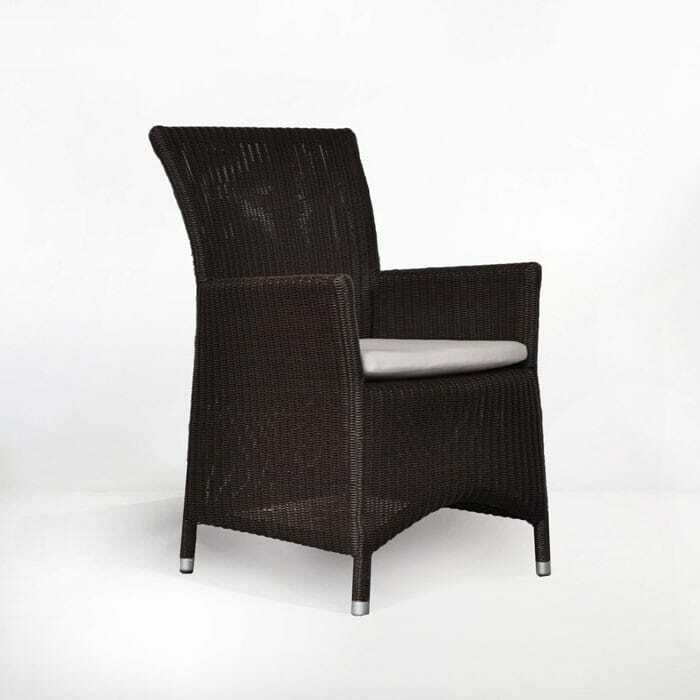 Handsome and stately; the Kona Arm Chair is making waves as the most elegant wicker dining chair we have in store and therefore the most popular! The Kona Arm Chair features a flared arm and tall back, with a sufficiently wide seat so you can enjoy long hours around the lunch or dinner table. A slender Viro® wicker is wrapped neatly around the sturdy aluminium frame, contributing to a polished and refined look. 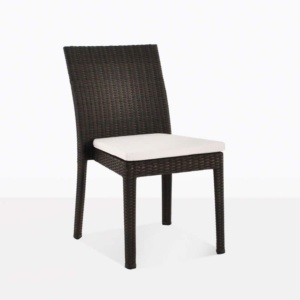 Whether you use this chair as part of your outdoor dining set, as a relaxing chair or even indoors, it will fulfil its brief as a comfortable and attractive wicker dining chair. Purchase one of our glorious Recycled Teak Rustic Tables and place a Kona Arm Chair at either end, with Kona Side Chairs running the length of the table; creating a wonderful collision of materials, with a touch of modern styling! The Kona Arm Chair also is a great chair to place on a modest balcony with a tall, narrow side table… ideal for those morning coffees or evening vinos! Make the look more contemporary with the addition of some Raw Concrete; try two Kona Arms in Java with a Round Raw Concrete Stool, a superb collaboration! The Kona Arm Chair is also a fuss free choice for indoors. Purchase to go around your kitchen or dining table, for easy clean ups, and a tasteful look that you’ll be thrilled with. Our Kona Chairs are made from award-winning Viro® wicker, wrapped elegantly around a powder coated aluminium frame, and dressed with a Sunbrella® cushion, ensuring an all weather product that will last for years and years to come!